In the furniture industry Microfiber was initially introduced with two names; micro-suede and ultra-suede™. As the names suggest, you could buy the look of suede or leather without the high cost. Microfiber is made using a variety of fiber types and is used in a multitude of products but when it comes to furniture the most commonly used fiber is polyester. There are essentially two forms of microfiber fabric; one is woven the other is flocked. Flocked simply means the fibers are shot onto a glue covered substrate. These short soft fibers are attached vertically and the finished product has a short nap that provides a soft and velvety effect (when brushed). Flocked is generally used on lower priced furniture due to the lower costs and speed at which it can be manufactured. Woven fabric also has a soft velvety feel but much less nap than flocked material. Due to market demands for inexpensive furniture woven material is harder to find and is generally used on higher priced furniture. Of the two types: Woven microfiber fabric can be manipulated to more closely mimic the texture of a suede product as compared to flocked material. On flocked material color is used to provide the visual effect of a suede product but little else is done with this manufacturing type. There are some advantages to buying woven microfiber; very tightly woven fabric allows less dust and other allergens to pass through the fabric. Those same tightly woven properties also make this furniture more liquid resistant. Spilled liquids form into beads and stay in this form longer on woven fabric – making it easy to blot up. Just don’t let it sit too long as it will eventually be absorbed by the fabric and could become as permanent stain. Flocked fabric provides some liquid resistance however since the fibers are vertical they tend to absorb liquids more readily. Regardless of fabric type all spills should be dealt with immediately to avoid unsightly stains on your furniture. Polyester is more stain resistant than many fabrics but it’s not bullet proof. There are downsides to both microfiber types but the main downside is a result of normal wear and tear inflicted upon the fabric. The friction caused by getting on and off of your furniture, slowly but surely wears away the fuzzy surface fibers. Over the long term bald areas form. Since micro means very small; the visible process of this friction is barely noticeable until larger areas appear and in the worst case the substrate material may become visible. On woven material worn areas happen much the same way however since there are little or no vertical fibers; wear and tear will appear as matted or dull patches. Worst case…the matted fabric wears away leaving a visible thatched pattern. Due to fiber shape and characteristics; cleaning becomes and ongoing issue. As the image shows there are many crevices for soil to become lodged. 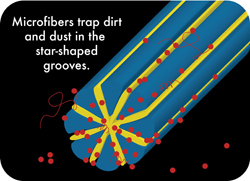 Since these fibers are very small so too are the trapped soil particles. Being so small it takes time before the fabric appears dirty to your eye. This collection of soil particles also acts like grit against the fabric which leads to the breakdown of the fabric and eventually the loss of fibers. Over time trapped soil particles become ground in and stay trapped even when a light cleaning is performed. Soil fusion within these crevices is also possible the longer professional cleaning is put off. Spot cleaning a spill or a soiled area can also lead to water mark problems since this fiber (by design) is quite absorbent. The water, detergent and small soil particles are pulled outward until eventually evaporating; at this point the soil particles left behind form an unsightly ring or water mark. This can be avoided by cleaning the entire panel and controlling the amount of water used and by removing excess water with a dry towel. Depending upon the amount of use any piece of furniture receives dictates how often it should be cleaned professionally. The family room sofa that is visited daily by kids and pets should be professionally cleaned annually. The sofa in the living room that is used only when the Queen visits can likely survive three or four years between cleanings. Maintenance is the key to longevity! The longer soil is allowed to stay within the fibers dictates how fast it wears out and if restorative cleaning measures will return it to a clean state. Even though furniture is relatively inexpensive these days it boils down to how often you want to replace your furniture or put up with unsightly fabric.